With an improved frame design, added features, and a new positive drive option, Dorner’s Next Generation AquaGard 7350 Series is the most advanced stainless conveyor for dry, wipe down and wet environment applications. Dorner’s AquaGard 7350 Series includes the modular belt curve conveyor with no openings greater than the international standard of 4mm, even within the curves, which increases safety by eliminating pinch points for operators. Added safety measures are also achieved by covering the upper and lower chain edges, and fully containing the drive system, which reduces catenary belt sag and conveyor noise. The modular belt conveyor system is designed to maximize available plant space by keeping the footprint as compact as possible. 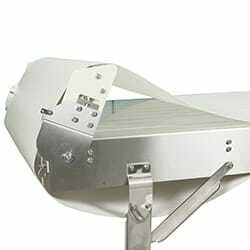 Infeed and outfeed sections are a compact 18”, further saving valuable floor space. The Positively Driven Belt on the AquaGard 7350 Series provides greater load capacity and less slippage in wet environments. 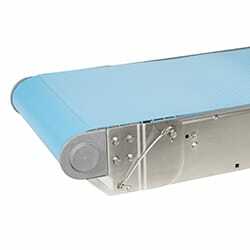 This reliable new belt option does not need to be tensioned or tracked, keeping your conveyors up and running to avoid costly downtime. The USDA accepted belting is made of solid urethane that won’t absorb water while the integrated UHMW return shoe provides positive belt control and drive sprocket engagement. The AquaGard 7350 Series’ tip-up tails provide ample access to the inside of the conveyor for effective, fast cleanings, and easy maintenance. Tails can be tipped up in just a few seconds with no tools, and then retracted and locked back into place with the same minimal effort. 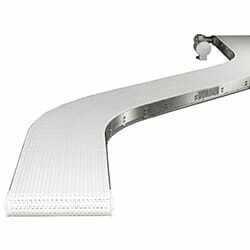 Tip-up tails are standard on the AquaGard 7350 straight-belt models, and also available on straight-running modular belt units. They come with improved strength in the tail for more rigidity and no flexing, as well as supporting the belt/chain closer to the tail for improved performance.